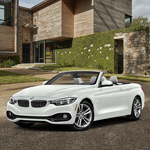 The 2018 BMW 4 series gets a refresh this year with a newer suspension and better handling than previous models, as well as new sensors that detect pedestrians, other cars, and provides warnings to the driver through the new infotainment system. You can connect any drive to the infotainment system through Bluetooth. It's best with your smartphone, which gives you voice-enabled commands to do most of the things from your vehicle, hands-free. The trims also have upgraded horsepower starting from the base engine. You can get a twin turbo with the base and go up to a twin turbo engine with the 440i. The Gran Turismo body style is one of the nicer trims that features a different body style altogether. You can also opt for sunroof, moonroof, premium audio system, leather seating, and sport packages. Want to test drive the latest 4 Series? Head over to Rick Hill BMW located in Kingsport.